I could have guessed that I’d be trying some more offal today. Pretty much all cultures but American eat every part of the animal. I read this study somewhere that with all the food that goes to waste in America, it actually takes something like 3,300 calories to sustain each one of us in the states. There’s something wrong with that system. 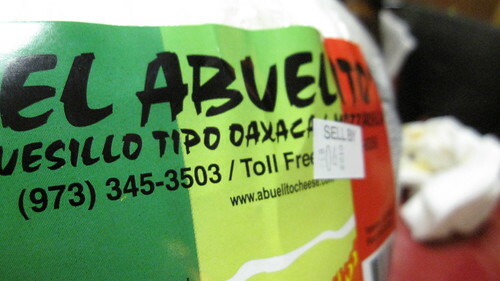 Everything is right at Xochimilco. Rafael (owner) and his family took it over three years ago and business has been booming. I know I get special treatment where I go, but the place just felt like a celebration. The entire Mata family was there to make our experience exquisite. I think that has a lot to do with why the food was so good. They say happy cows make better milk, and I think happy restaurants make better food. 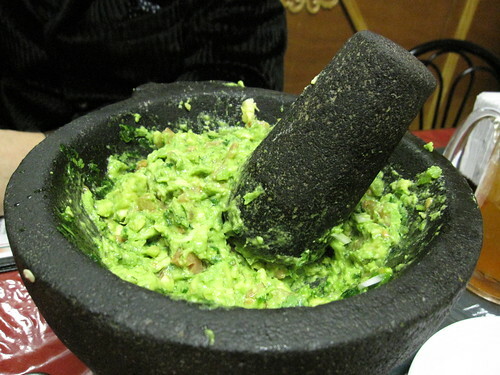 “That’s awesome that you guys brought the Guacamole out with the mortar and pestle (pic),” I said to Rafael. They have fun here. They make the Guac to order, but I think you get the idea. At Xochimilco more than any place I’ve been to so far, I get the feeling that they truly love the restaurant and love taking care of their customers. Maybe it has something to do with Rafael Junior’s claims that it’s a lot more fun than the laundromat they own, but I think they’re just good people. 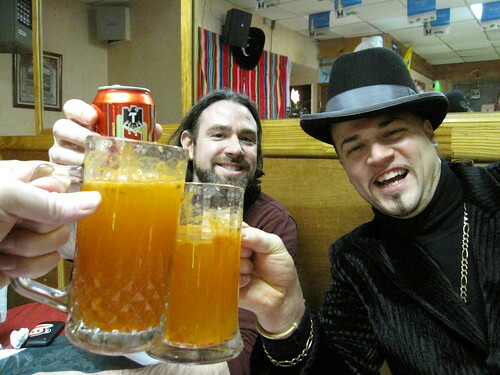 So the Panacita (top) and the Michelada (pic – in the mugs) are the only things that I know the names of, and that’s only because Baron said it on the video. We started with the michelada, which is basically a beer bloody mary (hot sauce, lime, and beer served in a glass with a salted rim) and it was a great start to the night. If you had too many of these, you might regret it the morning after; it’s spicy as hell. 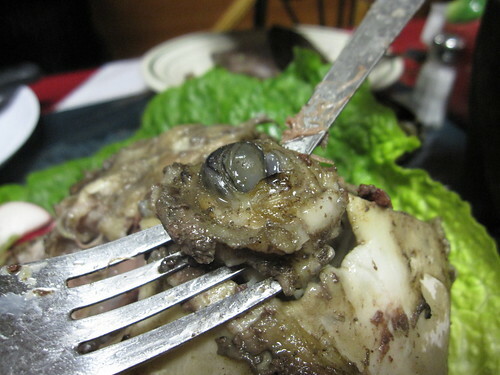 The Panacita, our first course, was blood sausage baked in a goat stomach. You know I’m an adventurous eater, but I’m not gonna lie to you here; I was scared of this stuff. It only takes one hand to count the number of white boys on the planet who dined on eye, brain, corn fungus, and blood sausage baked in a goat stomach last night. The panacita was awesome. Based on the area of the stomach you took the blood sausage from, there were different tastes to be had. The part I was most fond of was the dead center. It was a moist. less spicy chorizo with a more savory flavor. The outside was comparatively dry, dense and could be cut with a knife while the inside crumbled. I made a taco with the guac and salsa – gorgeous. The Super Nachos (above) ruled the day for me. Thick, home-made tortilla chips held their crispness even when soaked through with chorizo oil. The cheese (pic) was (dare I say) on par with the cheese of Grimaldi’s and trailed from the plate to my mouth in one beautifully supple, white, cheesy strand. 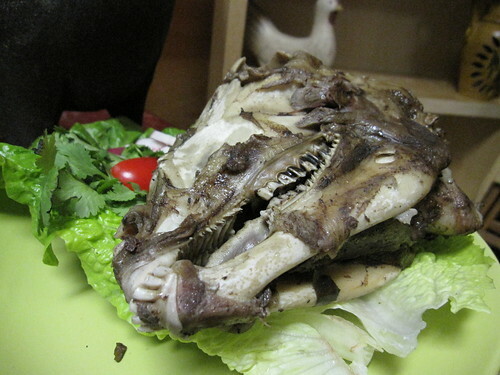 By the way, the pictures that follow are not for the faint of heart, but the next item was the Goat Head (pic). #1) Goat Eye (pic) #2) Goat Cheeks, #20,9219) Goat Brain (pic). Yes, you heard it here first I couldn’t handle the goat brain. The Baron said the eye tasted like lobster; I don’t know what lobster he was talking about, but it wasn’t any I’d had before. The consistency was quite lobster-like, and there was definitely a sweetness, so I could see where he was going with that call, but I wouldn’t tell a Mainer that goat eye tastes like lobster. The cheeks were greasy and firm; would have been unbelievable in a pastrami-ish sandwich. The brain; they told me to put salt on it, I forgot that and put hot sauce on it. Either that was a bad move, I don’t have a taste for brain, or I just couldn’t get past the fact that I was eating brain. I don’t know what it was, but I wasn’t a fan. I’m not shying away from brain for the rest of my life, but I couldn’t stomach another bite last night. The Chicken Cutlet sandwich (above), a Huitlacoche Quesadilla (wikipedia) and a Squash Blossom Quesadilla (I have no interesting pics of the quesadillas) rounded out the dinner. 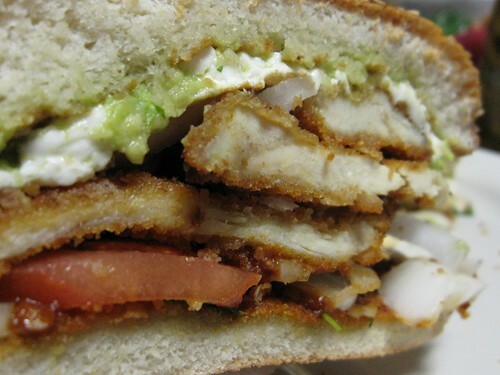 The chicken cutlet is named something else; it had a super strenght cilantro (I forget what it was … started with a P) on it that gave the sandwich a very fresco feel to the first bite. 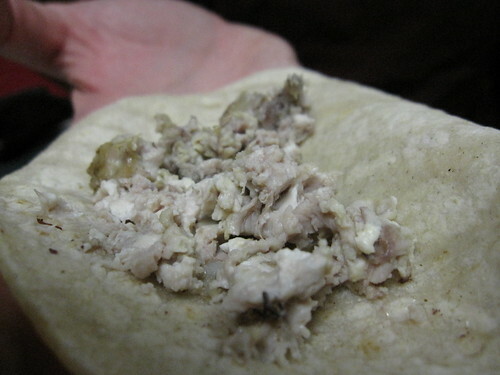 The huitlacoche quesadilla was the thing I was looking forward to the most; a corn fungus that farmers intentionally inflict on their crops to harvest. It was a robust, earthy flavor with a satisfying firm-spongy consistency that worked well as a meat substitute in this vegetarian dish. For our alliterative dessert; Plantains (left) and Poached Pears (pic). I was more full than I’ve been at any point of the project, but I soldiered on. Thank God I had just a little bit left in me. 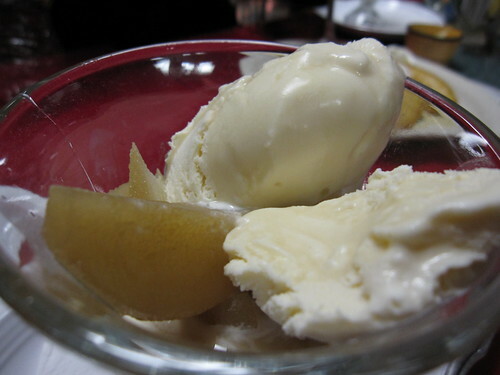 The poached pears came with a hint of cinnamon and sugar. To me, just OK, but The Baron and Ray raved about them. The plantains were my dessert of choice. 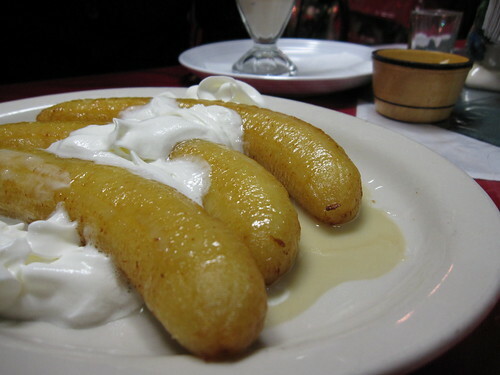 Lightly fried and drizzled in a pineapple juice-coconut milk reduction and topped with whipped cream (the favored way I take my cream), the banana brethren sent me home on a high note. Mexican in NYC, maybe not. Mexican in the Bronx? Check. Rafael said that he could have given me the standard tacos, nachos, and quesadillas, but he wanted me to taste something I’ve never had before. 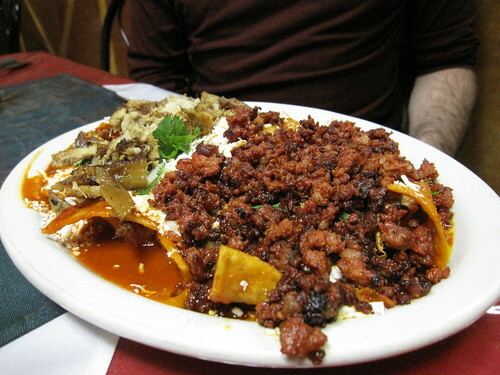 Foodie wussies need not apply at Xochimilco. The IRL Arts Foundation and The Wandering Foodie thank Xochimilco for providing this meal. This looks like quite an exciting place! 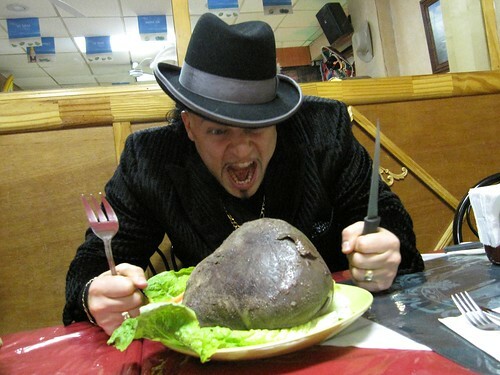 Wow, a culinary tour of the Bronx by Baron Ambrosia. Lucky man! Completely awesome! I have been an Ambrosia fan since the Underbelly podcast. Sounds like a great night. Bronx Power! I've been wanting to go here since I saw it on his show. I love the baron's eating style. great post, I definitely want to get up there now. how is the area though? is it fairly safe? You should be fine. It's right off the train. Baron Ambrosia have I told you lately that I love you?